Birmingham, with a population of over 1 million, is the largest Local Authority in Europe, and is the driving force in shaping the West Midlands for the next generation. It’s current development plan is however vastly out of date, originally adopted in 1993, and reviewed in 2005. Birmingham was a rather different place prior to the UDP’s adoption compared to now, and whilst the regenerative successes of the city is directly related to the strength of the UDP, it’s effect has waned in recent years, especially when considering the publication of the NPPF, and it’s consideration of development plans. On the 1st July 2014, Birmingham City Council submitted their Development Plan to the Secretary of State for examination. This marks the culmination of over 7 years of preparation; beginning in 2007 with what was then the Core Strategy. Following the abolishment of the Regional Spatial Strategies, the Localism Act of 2011, and the publication of the National Planning Policy Framework, the decision was taken to instead produce a Development Plan for the area for the period to 2031. The Birmingham Development plan is arguably one of the most important Development Plans within the both the West Midlands and England, due to the role it will play both in directing spatial development within the plan boundaries, but also providing economic growth, social and environmental benefits to authorities outside it. 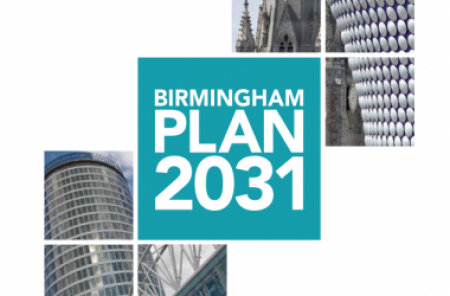 The examination, and potential subsequent adoption of the plan may affect anyone with a development interest within Birmingham. PJ Planning have extensive experience working within Birmingham, and are aware of the detailed issues and opportunities presented by the plan’s submission for examination. We have a proven track record in preparing representations to similar examinations, as well as providing written and oral evidence to the examinations themselves. With this in mind, should you require more information about how the plan’s submission will affect your development interests, or would like to know how we can provide professional services on your behalf, then please do not hesitate to contact us.